A recent Starfleet Media study of our friends in the B2B world states two out of three marketers are investing MORE resources to develop and disseminate content. According to the 2014 Benchmark Report on B2B Content Marketing and Lead Generation, “almost a quarter of the B2B marketers surveyed plan to more than double their spending on content marketing in the year ahead.” Another key takeaway: no one plans to spend less on content marketing. How do these branded content assets make it into the hands of prospects and customers? For starters, almost every B2B marketing organization relies on its sales force. That’s good to hear, since for B2B sales organizations (and their B2G counterparts), content by itself is often the gateway to a larger sales conversation that can lead to further qualification, relationships of trust, and conversion for expensive, highly considered purchases. 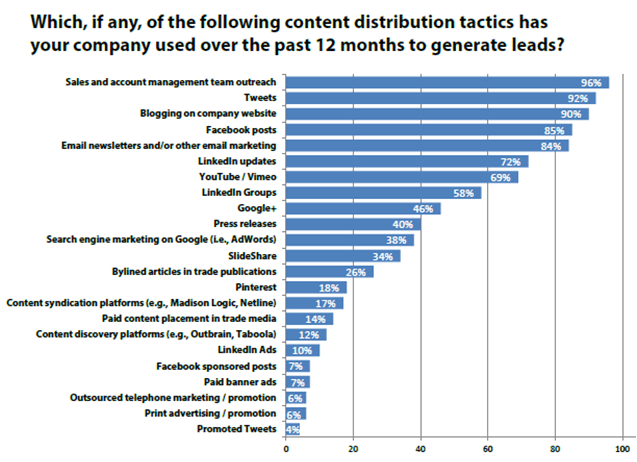 Yet social media plays an increasingly significant role in distributing content to B2B audiences, representing seven of the top 10 tactics used (as seen in the chart below). The results made me wonder whether these content marketing trends are equally relevant in the similar but unique realm of B2G marketing. So I turned to the 2014 Federal Media and Marketing Study, produced by market research firm Market Connections, for some clues. Market Connections’ analysis of 3,700 government employees points out that the decline of travel, trade shows, and conferences means federal employees are more likely to seek out information online. As a result, B2G marketers have even more incentive to focus on content as a core marketing vehicle. In next week’s post I’ll unveil several more top takeaways, many of which I’ll explore in greater depth with a panel of B2G marketing experts at the upcoming Government IT Sales Summit. I hope you can join us there! Make sure to register before October 6 to get the early bird rate. Great stuff here Alan. This type of research-based content is extremely helpful in opening the eyes of our CEO and other ‘less believers’ within our organization when it comes to marketing, and how best to reach/impact our current client base as well as attracting and engaging new prospects. Thanks for the comments. I’m glad to hear it’s helpful. I’ve got a “Part 2” drafted to dive a bit deeper into how to apply some of this to the B2G audience, and as noted we’ll be discussing it at our upcoming Government IT Sales Summit in November. I’m surprised how many B2B marketers are using Facebook. I would not have thought that was the best business arena. Great read, Allan. Here is a sobering statistic from recent research conducted by Forrester, Business Marketing Association and the Online Marketing Institute: more than 8o percent of marketers are unable to measure any meaningful ROI from their investment in content marketing. Full disclosure: my consultancy (Strategic Communications Group) works for immixGroup on a content marketing program.